Jasper Fforde, author of what must surely be some of the quirkiest and most original fiction around at the moment, has done it again. 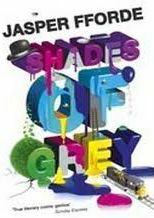 Not content with creating three other vividly imagined and quite different universes for his Thursday Next, Nursery Crime and Dragonslayer series of books, he has come up with a fourth in the shape of Shades of Grey. If I call Shades of Grey a fantasy novel, I am sure to put many readers off; likewise if I refer to it as being high concept fiction. The book is both, but please don’t let such labels put you off trying it, as it has to be one of the most fascinating fictional universes I have entered in a long time and it is well worth reading. Shades of Grey is set in society that has grown up several centuries after “the Something that Happened” to the Previous, yet for a post-apocalyptic world everything is calm and well-ordered. Perhaps too well-ordered. Sometime in the past were set down the Rules, which everyone has to adhere slavishly to, lest they are given demerits for committing infractions. Acquire too many demerits and you find yourself packed off to Reboot, a place where you are re-educated to respect the way things are done, dress properly and go about discharging your Civic Responsibility to the Collective. Yet the really interesting thing about this society is way that colour works. Unlike us, the people who inhabit this world perceive it in black and white, and have no night vision at all; in their twentieth year, each resident is tested for colour perception and is awarded their place in society on the basis of what they can see. Perceiving no colour at all makes you a despised Grey, condemned to a life of menial servitude, while those who can see some colour are awarded their hue based on that which they can see most of. A rigid caste system results, with the Purples at the top, followed by carefully ranked primary colours; within each colour you are ranked again by how much of that colour you see and those who can see the most are automatically in charge. The Alpha Purple thus becomes Head Prefect of the village, while the Alpha Red, Yellow and Blue become Prefects. Enter into this strange universe Eddie Russett, a young Red shipped off to a provincial village after daring to suggest improvements to the standard queuing system without first obtaining the necessary permission to do so. He arrives in East Carmine equipped with his “needs humility” badge and an order to conduct a chair census by means of punishment, but instead finds all manner of unexpected occurrences to distract him from this important work. First there is the Grey man who died in an attempt to pass himself off as Purple and obtain some illegal colour from the regional Paint Shop, and then his suspicions are aroused around the death of the local swatchman – the man who heals residents with colour swatches. If that is not enough, he has to contend with falling hopelessly in love with Jane, a local Grey with an unhealthy disregard for the Rules who would be a quite unsuitable match for Eddie – especially when his father has a lucrative plan in the pipeline to cash-in on his son’s potential to marry up-hue. Eddie is thus about to experience the most eventful four days of his young life. It is an ingenious and intriguing concept. Implausible, yes, but the world of the Chromatica is so well-constructed and brought to life that I found this didn’t matter in the slightest. In fact, it was quite a pleasant change from stories set in our reality. The use of colour, not just as social order, but as medicine, intoxication, industry, economy, system of surnames and law is quite wonderfully well-done and very clever. You could easily criticise Shades of Grey as being thin on plot for the first half of the book, as it involves little more than Eddie exploring his new village and showing us how his world works – this is necessary to understand the plotting when it does get going, but despite the slowness of the start I rather enjoyed the world-building Fforde has given us as it is clever, humorous and rich in puns. The world, for all its dystopian traditions, is charmingly eccentric and a pleasure to visit, almost Pythonesque in its ridiculousness. The story when it does get going, turns out to be an exciting page-turner that I won’t spoil for you here; suffice to say it resolves enough of the story to be satisfying, while leaving plenty open for the next installment. As with all of Fforde’s universes, there is sufficient abundance of imagination to fill a dozen books with wonderful stories, but this series is only planned to be three novels long – and before he gets to the end of that, he will doubtless have created another couple of fully-working and original universes for other characters to live in. Personally, I can’t wait for next book in the Shades of Grey series to be released. Until then, though, you may want to have a look at the rather nice selection of background material and “extras” that Fforde has posted on his website. No Comments on "Shades of Grey"